Many Internet sites and many of the applications that we install on our computer send private information, with or without our permission, that is compiled and stored in certain files on our hard drive. Download Privacy Guardian to avoid it. When you have an Internet connection it's essential to guarantee complete confidentiality of your actions to install an application that intercepts this activity. 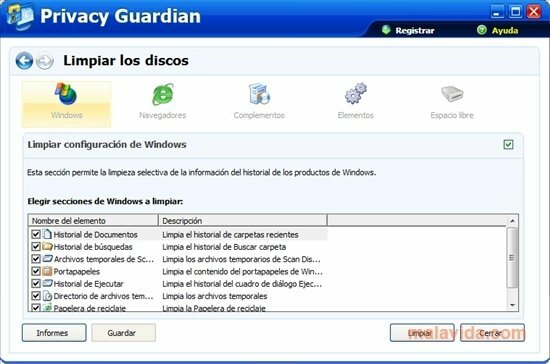 Privacy Guardian guarantees your privacy while using your computer by constantly erasing any personal information, including statistics of use. Furthermore, by doing so it improves the system's performance and frees space on the drive. 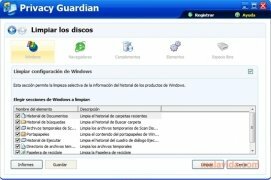 - Eliminates the personal information compiled by Windows, Microsoft Office, Netscape, Windows Media Player and Internet Explorer. - Allows permanent file deletion. 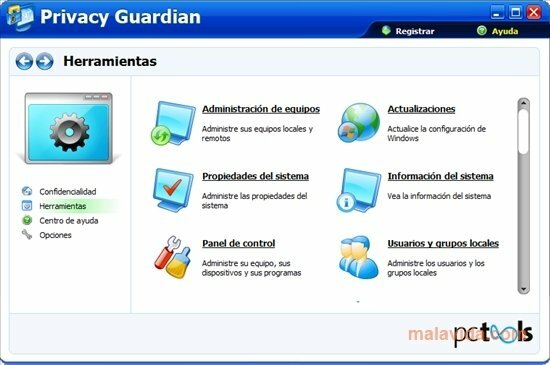 Recover your privacy when working on a computer with an Internet connection, thanks to Privacy Guardian.